My players are about to start exploring a portion of a city which has been abandoned since the Clone Wars. When they find their destination and start exploring, I'm planning on having them disturb a nest of womp rats; if they fight the beasts (which are only defending their nest), the commotion attracts a squadron of battle droids which are still wandering the ruins, fighting a war they don't know is over. My question is: how many womp rats and battle droids should they encounter? This is actually a problem I struggle with on a regular basis. I feel like I always either use too many minions or too few. Is there a formula for determining how many minions will make a fight easy, difficult, or challenging? Edit: the PCs wound up bypassing the womp rats and surviving against six B1 battle droids, for which I used the "Antiquated Battle Droid" stats on page 410 of Edge of the Empire. Ugh, I did a big post on this a while ago that was really good, but I can't find it. So I'll try my best to summarize here! So, the big thing is that it depends on your party. If you've got a club of saber-monkeys or bounty hunters packing serious (Ranged-Heavy) heat, it's different than if your party is mostly scholars with knowledge- or sensory- abilities. What I'd do is look at your party's average "round," what is each character's primary weapon, and how much damage would it deal if it hits the enemy you're wanting to use? You want to set the number of minions in the group so that they can't be one-shot by an average hit from the best combat character in the group, but a strong hit (likely with a crit) might be able to do it. Also, set the number of minion groups so that every combat-focused character has one to two to occupy them, and the rest of the party has one to deal with, maybe two if there are a lot of non-combat characters. You also want to look at the characters' defensive abilities. On an average hit from the bad guys, how much would it hurt? Can it take anyone down in one shot? What if you roll really well? If you consider the enemy's average roll, how many hits would it take to completely wipe the party? You want to make sure that they're not going to bust the party up too bad. In this instance, since it's a combo encounter, the womp rats will likely be a bit weaker, easier targets, while the battle droids will pack more punch. I'd do more womp rats, fewer droids. Maybe one group of 4-ish droids (a squad out on a "scouting mission") drops by when they hear the commotion, with three or four groups of three womp rats each, as a starting guess. Obviously, I don't know anything about the party, their level of XP, the enemies, etc. That's just a guess. If I could get some stats, I could walk you through my process on how I'd build the encounter to help give you an example? EDIT: Sorry, I looked through every single one of my posts through September of 2017, and I couldn't find the other post I was talking about . I may go back to looking soon, but for now, this post will have to do. Hmm, so it's just the two of them? Then my previous suggestion was way too much. What about the bad guys? What are their stats? I only have half of the equation here . I can look them up late tonight when I get to my books, but that sounds like it'll be too late for you. Think about your minion groups before the play session. Look at their dice rolls. Consider 4 womp rats and make that combat roll and see what kind of damage you are going to do to the player. Consider the players and how much damage they can do to the womp rats. Rolls some dice and see the results. After a few practice rolls both ways you may find that minion groups of 4 are too big, and that 2 or 3 is better. Also, be on the lookout for differing power levels later on. In my party of 4, 2 have gone for a combat focus, and 2 have gone non-combat. A minion group of 4 stormtroopers with blaster rifles have the potential to 1 or 2 shot the non-combat guys even after 500 xp. But a minion group of 4 Imperial army soldiers with blaster pistols won't likely do more than a point or two of damage with a good roll, and most of the time won't even be a threat to them. So you may end up having to really mix up encounters to give all players a way to contribute. What about the bad guys? What are their stats? Abilities: Worrying Bite: Womp Rats bite and don't let go. A target takes 1 Wound at the start of its turn if it is Immobilized by the Womp Rats. Gray Rot - A plague that causes the skin to turn gray and decay, eventually becoming scabrous, cracked, ulcerated, and causing death. Anyone that receives a Critical from a Womp Rat is inflicted with Gray Rot. After the battle, the inflicted character makes a Hard Resilience check. Success means they have fought off the disease. Advantages can be spent to add boosts to checks to heal the Critical. Triumph means the character is immune to Gray Rot. Failure means the Gray Rot inflicts 2 Wounds, plus 1 wound per day infected, each day on the victim until the Critical Wound is healed. Threats can be used to add Setback dice to heal the Critical. Despair means the victim takes a second critical wound immediately. The players already know to expect wamp rats, but the guy who sent them on this quest forgot to mention the battle droids, possibly because everyone knows about those, possibly because he might be a little senile. I just finished running the adventure I had planned. They never fought the womp rats, preferring to not harm animals who were simply defending their nest, so I increased the number of battle droids from four to six to make up for it. They barely made it out alive, but they did survive despite being outnumbered and my using Dark Side Destiny Points pretty liberally. I think they've learned an important lesson: when there are only two PCs in the party, it's important to invest in plenty of stimpaks and better armor! How did you run the battle droids. Keep in mind that minion groups are flexible. 6 droids could be 1 set of 6, 2 sets of 3, 3 sets of 2. It changes the power dynamics considerably. 1 set of 6 rolls 2Y/4G. That is a potentially massive chunk of damage. Where 3 sets of 2 roll 3G each. Same total number of dice, but with no chance of triumph along with a lower critical chance. When you consider the difficulty dice thrown in, 2 purple and a black won't stop the 2Y/4G attack, but it could severely hinder the 3G attacks. Damage potential of the 2Y/4G is 21, which is enough to obliterate characters, especially lower skilled or non-combat focused ones. The damage potential of the 3Gs is 15 each for a total of 45. But keep in mind that your difficulty dice will negate more damage, 1 or more of the attacks might miss, your soak is applied to each attack, and you can spread the attacks out among the characters. Smaller minion groups means higher reductions of damage when you eliminate minions also. Take out 2 of a group of 6 and you still have a 5G attack which is only a slight change. Take out 2 of the groups of 2 and you reduced potential damage by 1/3. One way or the other, blaster rifles are a dangerous threat to new characters. I try to avoid using them in large scale early on. One way to do this is to swap the weapon for something else. Another way to do this is to mess with the weapons or other aspects of the encounter. These are antiquated battle droids using antiquated blaster rifles after all right? Not like they had a cache of blaster rifles delivered to them on a regular basis. Time and environment can wear away at these things. Maybe lower their agility to 1. Lower blaster damage to 6. Lower their soak to 2 due to rust. Or lower their wounds to 3. Adding other factors can be interesting too. Adding inaccurate to the weapons due to age. Or have 2 threats cause them to run out of ammo, or the weapons to misfire. Giving them limited ammo (perhaps just 1 as the rest of the energy charge has drained from the weapon). They get in one good shot on the characters that way, but then are forced to fight hand to hand which significantly reduces their damage. This system leaves a LOT of room for adjusting and modifying the various elements of a single encounter to fit any situation. How did you run the battle droids? Keep in mind that minion groups are flexible. 6 droids could be 1 set of 6, 2 sets of 3, 3 sets of 2. It changes the power dynamics considerably. A squad of 6 droids tried to ambush the PCs, but they players turned the tables and ambushed the droids while they were halfway down a staircase between levels, effectively cutting the squad in half (becoming two groups of three) and reducing the droids' ability to support one another. One way or the other, blaster rifles are a dangerous threat to new characters. I try to avoid using them in large scale early on. Yeah, I noticed that the PCs had a lot of trouble against the droids' blasters, and it would have been a good idea to change out their weapons to something else. I was using the Adversaries app, so changing their stats didn't even occur to me. I wish I had thought about their damage rating beforehand, but my mind was only focusing on how many droids there were, and how many minion groups they were divided into. I'm still getting a feel for how damage works in this system. Oh well, I'll just have to learn from my (luckily non-fatal) mistake. I figured if the PCs lost, I'd have the droids take them somewhere to await transport to a Confederate POW camp (which was, obviously, never going to arrive). But luckily they made it through in one piece. All good ideas. 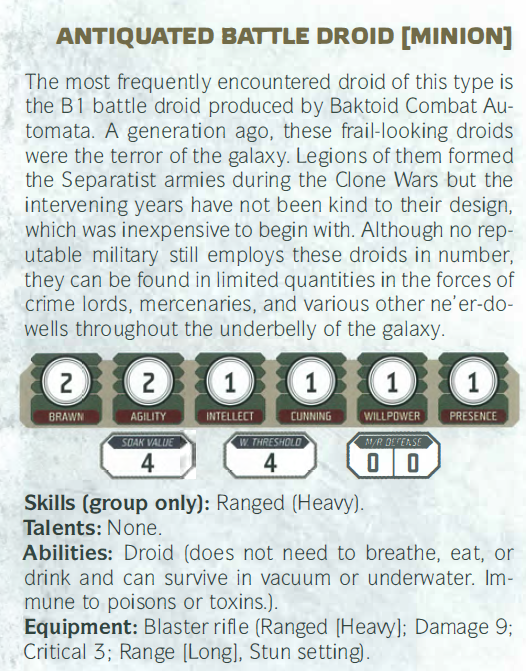 The PCs will have to fight against a unit of B2 commando droids and even a droideka(!) later on, and I'll consider applying some of your suggestions to their stats so the PCs don't get steamrollered at the final boss fight. Thanks so much! Wait, Womp rats are MINIONS? They're (not much) BIGGER than TWO METERS! You are supposed to take airspeeder weapons to deal with them!